Marshall Lytle (September 1, 1933 – May 25, 2013) was an American rock and roll bassist, best known for his work with the groups Bill Haley & His Comets and The Jodimars in the 1950s. Born in Old Fort, North Carolina, Lytle was a guitar player before joining Bill Haley’s country music group, The Saddlemen, in 1951. 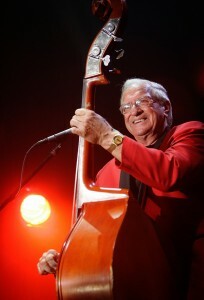 But Lytle was hired to play double bass for the group, replacing departing musician Al Rex, so Haley taught Lytle the basics of slap bass playing. Lytle, who was only a teenager at the time, grew a moustache in order to look a little older, and became a full-time member of The Saddlemen and, in September 1952, he was with the group when they changed their name to Bill Haley & His Comets. Soon after, Lytle co-wrote with Haley the band’s first national hit, “Crazy Man, Crazy” although he did not receive co-authorship credit for it (until 2002). Lytle played on all of Haley’s recordings between mid-1951 and the summer of 1955, including the epochal “Rock Around the Clock” in 1954. He played a late 1940s model Epiphone B5 upright double bass, purchased in October, 1951, for about $275. He used gut strings for the G and D strings while the A and E strings were wound. Lytle’s style of playing, which involved slapping the strings to make a percussive sound, is considered one of the signature sounds of early rock and roll and rockabilly. The athletic Lytle also developed a stage routine, along with Ambrose, that involved doing acrobatic stunts with the bass fiddle, including throwing it in the air and riding it like a horse. In 2012, Lytle was inducted as a member of the Comets into the Rock and Roll Hall of Fame.